On February 4 each year, World Cancer Day is observed. This international event was founded by the Union for International Cancer Control (UICC) and is supported by the World Health Organization, International Agency for Research on Cancer and numerous international, national, and local health agencies. Cancer is a group of diseases that involve abnormal and uncontrolled cell growth. It can affect almost any body part, there are over 100 types of cancer. Although not all cancers can be prevented, a significant proportion of them is preventable and/or curable. Cancer is a leading cause of death worldwide, but it is not necessarily a death sentence. 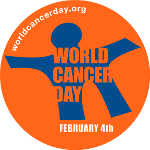 World Cancer Day was established in order to support the goals of the 2008 World Cancer Declaration. Its ultimate aim is to significantly reduce cancer mortality by 2020. The campaign focuses on raising awareness of cancer and encouraging the prevention, detection and treatment of the illness. Each year, a new World Cancer Day tagline is chosen. On the official World Cancer Day website (worldcancerday.org), there are resources in multiple languages to help organize the events as well as the map of events held in the countries around the world. Organizations and individuals participating in the campaign are encouraged to share their plans so that more people can partake in their events.